Clean room tests – Medyag Kft. Certain industrial or laboratory operations and tests require qualified environments that ensure minimal contamination of the treated materials or phase products. The HVAC system is part of the adequate environment that meets special regulations (e.g. GMP). It continuously ensures effective ventilation; the optimal technical design of these systems enables measuring and verifying certain parameters (e.g. particle contamination, air velocity, air volume, flow direction, temperature, and humidity) during continuous monitoring and regular reviews (qualifications). Our measuring processes can be applied not only for qualifying HVAC systems but also for optimizing and verifying the suitability of certain sub-processes. By applying our measuring equipment individually or in a system, we can continuously monitor the operation of the supply system as of the installation stage, and in case of installing a new system or taking corrective measures, the changes can be checked as soon as possible. The laser beam is scattered on any airborne particles in the sampling chamber of the mobile particle counter. In the photocells this scattered light is converted into voltage impulses which are proportional to the particle size. This method can be applied for determining how the requirements set by different cleanliness class standards or regulations are met (e.g. GMP). The method can also be used for checking the workspace of laminar air flow cabinets or verifying the surface integrity and installation tightness of the HEPA filters. Prior to filter integrity tests, test-aerosol is produced. The test-aerosol is led into the HVAC system, then the percentage value of leakage is defined with the help of a photometer. 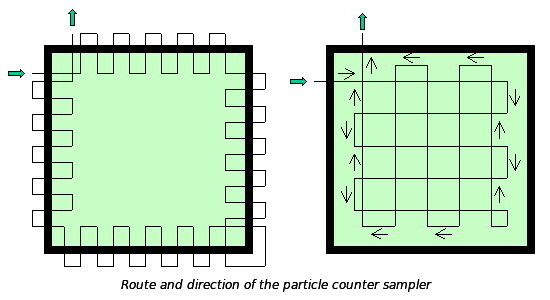 This test is performed by moving the sampler of the particle counter in front of the filter rim and the filter surface. The velocity of the air flowing through the installed filter or anemostat can be measured and registered with the help of a hot-wire air velocity meter or an air velocity matrix as part of the HVAC measurements or as an individual test. Air volume flowing through the installed HEPA filters and the anemostats of the HVAC systems is defined with the help of a balometer. The installed micromanometer of the balometer, which can also be used as an independent metering unit, is suitable for measuring positive or negative pressure, differential pressure, temperature, and humidity. Moreover, air velocity values can be defined by applying an optional velocity matrix. The fog generator installed in the air flow control equipment generates a “smoke signal” that visually indicates or certifies the relative intensity, direction, and quality (e.g. laminar flow) of the air flow produced by any HVAC system or the laminar air flow cabinet. The pressure differentials of clean rooms can be determined as part of HVAC measurements or as an individual test. The current pressure difference values are metered and registered with the help of a differential manometer. The room temperature and/or relative humidity can be defined at one or more points as part of HVAC measurements or as an individual test. The microbial contamination of cleanroom air is defined by microbiological sampling. 1m³ air is blown through the air sampler placed in the cleanroom then microorganisms adhered on the solid medium are grown, counted, or identified upon request.